It is a must for local bank to issue the new EMV Cards for the security of the depositors. It is now mandated and free of charge. A few months ago, I already claimed my EMV card at another local bank and was waiting for BPI to do the same. Actually, they can give you one but you have to pay for it. They advice that I should wait for the roll out sometime soon to be able to have a free charge for it. I arrived early in the afternoon because I couldn't left my kid in the morning. Upon arriving at BPI Batangas Main Branch, there are already pile of people waiting at a tent covered area at the parking lot. The guards are assisting one by one and giving out forms enclosed in a folder with pens already! Imagine the ease of filling up these forms in a way that I don't need to buy a ball pen nor borrow from my seatmate. The guard told me that if I don't want to wait since the queue is already long, there are other schedules every Saturday. I decided to wait, which is good thing because it didn't last for 30 minutes and our batch was called already to proceed to next step, VERIFICATION. I spotted Ma'am Sharon at the desk and so I proceed at her line, there were three to choose from. Ma'am Sharon was the one who helped me open up my payroll account at BPI and I didn't expect that she still remembers me. It's been 7 years or so when I first open an account there. Upon submitting my requirements, she asked me how I was and told me "uy ineng, kamusta ka na" and started asking me questions to verify and check my forms. "Wow, natatandaan niyo pa ako, kakatuwa naman". After a mere verification she told me to proceed at the card releasing section wherein Ma'am (sorry I forgot her name, she's the one who assisted me when I open up my UITF account) *** was smiling already because she also remembers me. She instantly catered me inside and told me to sit beside with the last person seated on the queue. Upon entering, I also noticed that they are fully man powered that day. Even the manager is all smiles assisting the Seniors and also telling us that we can avail the 14.99 one time payment accident insurance. The bank teller told me that I can still use my old atm card for a month as it will not be disabled upon availing the new one. It wasn't long after when I got in the desk of the card releasing section. For every 20-30 seconds, someone is already done and received their card. Then they will proceed to their next step, changing the ATM PIN. There are three ATM Machines for the ATM PIN change or nomination, each machine has a BPI employee in charge assisting the account holders for their easy process. They will ask you to insert your old BPI ATM card and then next is the new one wherein you will be asked to nominate a new 6 digit PIN. Finally, I wouldn't have any trouble remembering which of my account is 4 digit and 6 digit because they are the same now. 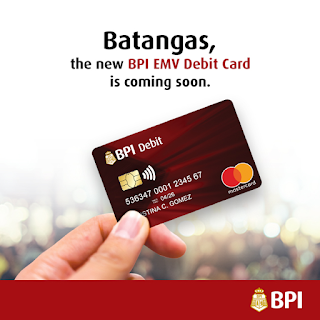 After that, they will tell you that the new BPI EMV Debit card will be available for transaction after 24 hours. That was fast. Good thing that I waited outside instead of pushing my luck on other dates. People are all smiles and I can't hear any complains aside from they cannot seat anymore because they keep on seating on the next chair every 30 seconds so. Truly, that was a fast transaction after all. Much faster than waiting for your queue at a Government Institution. The strategy works well and I overheard them that they might use it again the following week or think for another strategy to make it even more faster and convenient. I can't post photos from the branch since it is not allowed to take photos. You could have seen how efficient their strategy was. But if you are from Batangas Branch Main, I guess you would agree on my post. For more information on how to get yours, please visit BPI website.